The days go by way too fast – the promotion that started out this Tuesday at CasinoLuck is already heading towards the end. However, there are some offers left for you to claim if you want to! How about entering a draw with free spins prizes? Or a reload bonus or even more free rounds? You’ll be able to look forward to all of this if you just visit CasinoLuck today. If you don’t have an account at the casino yet you might want to know more about it before you open one. You can always read our review of CasinoLuck before you do anything else. By doing so you will be able to claim a generous welcome bonus as well! Like we mentioned before you will be able to get free rounds at CasinoLuck today. All you have to do in order to get these is a deposit. 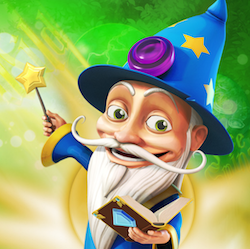 You will have to deposit at least £20 and then you will be rewarded with 25 free spins on the cool videoslot called Magic Portals. It might be good to know that you will receive your spins tomorrow at 15:00 GMT. Remember that there will be wagering requirements connected to both bonus money and free spins winnings when you’re playing at CasinoLuck. When you log in tomorrow to grab your bonus spins you will also be able to claim another offer if you feel like it. There will be a special draw and if you want to enter it you’ll have to play at least 33 rounds on any videoslots you want to. In that raffle there will be 10 winners and these players can look forward to 100 bonus spins each on the videoslot called Secret of the Stones. Last but not least you can claim a reload bonus during the weekend. Choose to make a deposit on either Saturday or Sunday together with the special bonus code CLWIZARDS. Then you will get 50% extra up to £100. If you think this sounds like fun you can become a member at CasinoLuck today and at the same time you will be able to accept a huge welcome bonus. It all starts with 25 free spins as a no deposit bonus on Starburst when you sign up. After that you will get 150% extra up to £150 on your first deposit together with an additional 250 free rounds. When you make your second deposit you will get 50% extra up to £200 and last but not least you will get 75% extra up to £150 if you use the bonus code LUCK3.